Upgrading the hardware of a product has been an inflexible, time consuming and wasteful process. Once a component is incorporated into the circuitry of a PCB there was no way to remove it or swap it out without throwing it away and beginning again. This has changed with the rhomb.io manufacturing system, which has changed the manufacturing process and the lifecycle of electronic devices. With our selection of PCB‘s and easy to add and remove modules, upgrading and customising your hardware is now fast and cheap. No longer do you need to redesign circuitry to incorporate hardware changes. Upgrading from an SCM-i.MX6 to an Exynos 4412 microprocessor for a device built with rhomb.io components, simply prying the old core module from its socket on the rhomb.io PCB and press in the new core module. Adding new features is just as fast and is achieved in the same way. Just press the modules with the capabilities you want into the free sockets on the PCB. See below where we have added wireless connectivity, GPS and an Exynos 4412 microprocessor to a Hyperion PCB. Rhomb.io carrier boards form the foundation of your electronic device. Each carrier boards is created with a number of sockets. This is where the rhomb.io modules are attached – and where the system gets its name. There is no limit to the number of sockets a board can have. Choose between pre-designed boards or create your own – either collaboratively with our technical team or privately. All information related to the boards is open source. 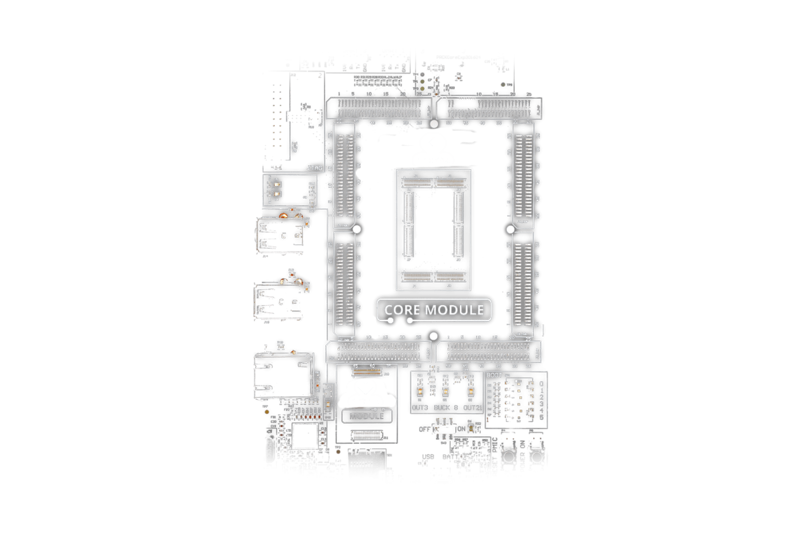 There are 3 module families: Cores modules, Master modules and Slave modules. – Core modules contain our powerful microprocessors and are able to run a complete operative system. – Master modules are based around a microcontroller. – And Slave modules are made up of peripherals like sensors, connectivity modules, memory, GPS, cameras and much more. For developers who need greater customisation capabilities, we provide all schematics, bill of materials and fabrication files of our modules online as well. This way development teams can customise the components going into their electrical devices to meet their needs. If you have any questions about our manufacturing process, please don’t hesitate to reach out here. Or you can browse our online shop here.